I know this seems simple enough, but surprisingly, many people don’t know about this method for cooking bacon. 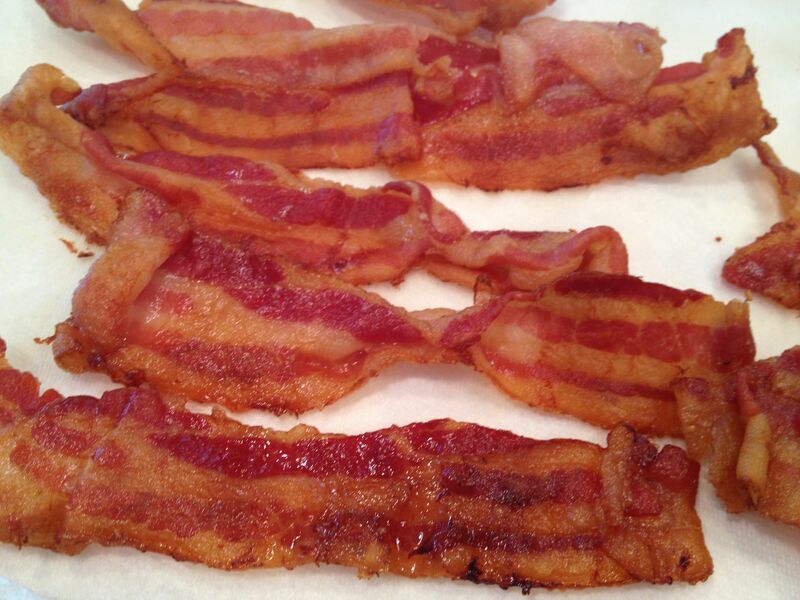 Oven roasting the bacon is quick, easy, and produces a nice crunchy evenly cooked bacon slice everytime. I promise you that once you do this, you’ll never scorch your poor little hands frying bacon in a pan ever again! And best of all, there’s no greasy messy stove top to clean when you’re done. Preheat oven to 400 degrees. Line a jelly roll pan with parchment paper or aluminmum foil. Lay out strips of bacon on pan side by side. Bake in oven for about 15 – 20 minutes until the bacon is nice and crispy. 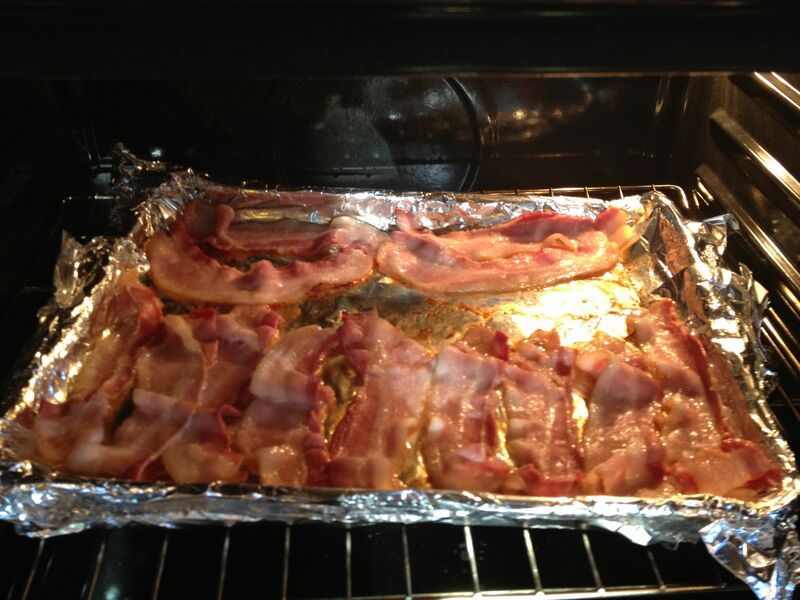 Remove from oven, and drain bacon on paper towels to remove excess grease. Serve. 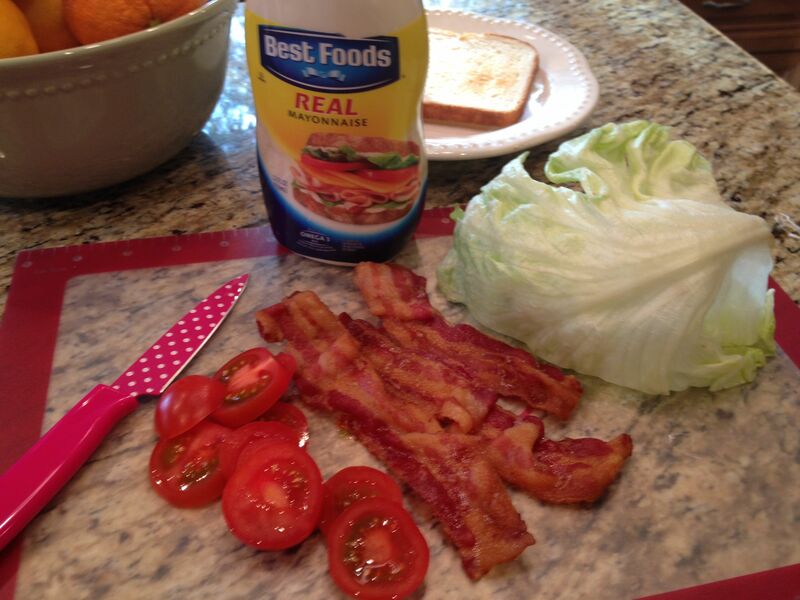 So, you can probably guess from the picture above where I’m going with this… crispy bacon = BLT! 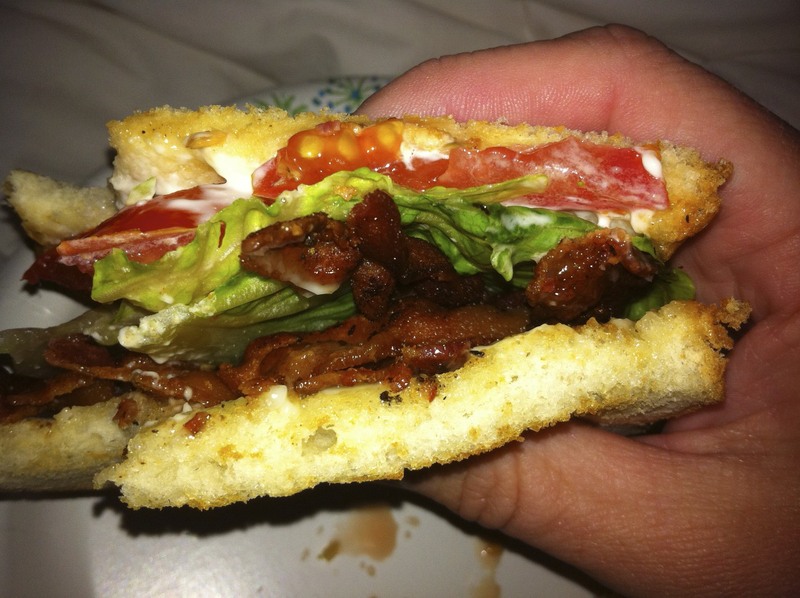 I don’t eat this sandwich a lot, but something about smelling that bacon cooking and knowing that I had some wonderful ripe pearl tomatoes in my fridge made me start thinking about how good a BLT would taste. I like mine that plain, old fashioned way. Just 2 slices of lightly toasted white bread, laid out open faced, each with a dollop of Best Foods mayonaise spread on it. Then I line each slice with 3 slices of bacon. Put some tomatoes on one side, some lettuce on the other and press the 2 together. Delish! Just try to tell me you don’t want one of these right now! Go ahead, make yourself one… it’s easy! 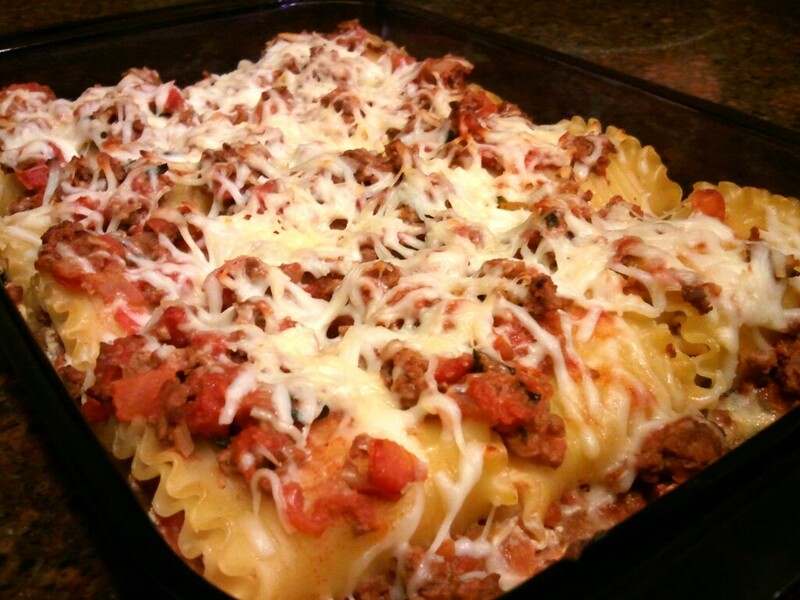 This recipe is adapted from one that is floating around on Pinterest right now. 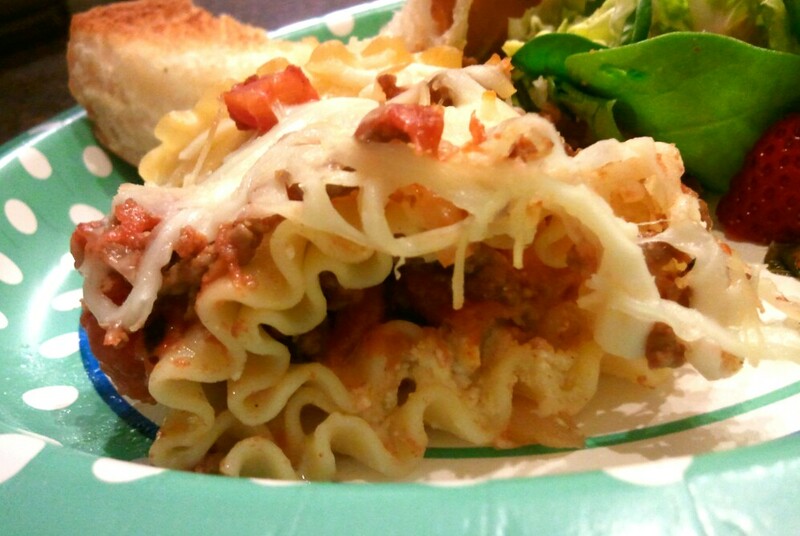 It’s super easy to make and my family LOVED it. 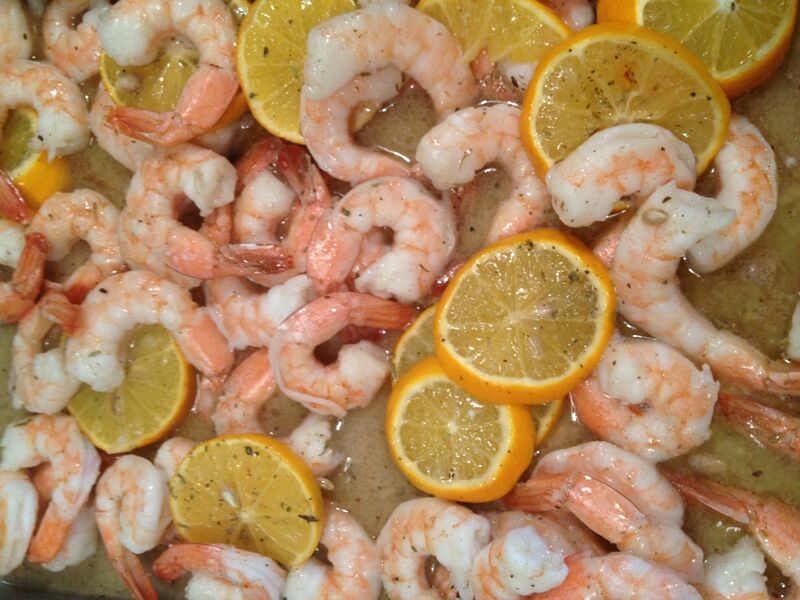 The butter melds with the shrimp and the lemony Italian hues are just right, not over powering. In a 9×13 pan, and a 350 degree oven. Melt a stick of butter in the pan. Remove pan from oven and put sliced lemons on top of butter. Then layer the shrimp. Sprinkle with the Italian seasoning and bake for 15 minutes. Stir halfway through to coat shrimp with butter and seasoning. Serve over rice with your favorite veggie. So let’s talk about Pinterest for a moment. I am addicted just like the next person, but I am finding that a lot of the “material” is now going around for a second time. It’s taking the fun out of it for me a little. I am also finding that people are pinning things to Etsy shops or people’s personal work that they sell for money. Breaks my heart, actually. That artist worked hard for the inspiration and deserves credit for their work. It is sad to me that many of us may have done this! What if this is someone’s sole income? Who am I to go steal a great idea because I think I can make it, too? Of course, there are specific sites that are full of tutorials and are meant to be pinned and shared. Or the people that openly share and give tips and its obvious that they want people to “copy” them. Having said all this, Lucy Jane’s Best wants you to know that we feel awesome whenever anyone “Pins” one of our recipes. We want to share what we feel are really great recipes! So “Pin” away on our site! Share it on Facebook! We are okay with that! So I found this recipe on Pinterest. But the picture took me back to myrecipes.com. You can find the original recipe here, but I will also repost for you below, tweaked just a tiny bit. I needed a quick and easy chicken dinner and had seen this on one of my friends Pinterest boards. So I gave it a shot. I shall start by saying it makes a lot. A thick layer of 9×13 pan, a lot. It is a very simple recipe with almost no fluff. (I thought the Ritz cracker topping was a good idea!) 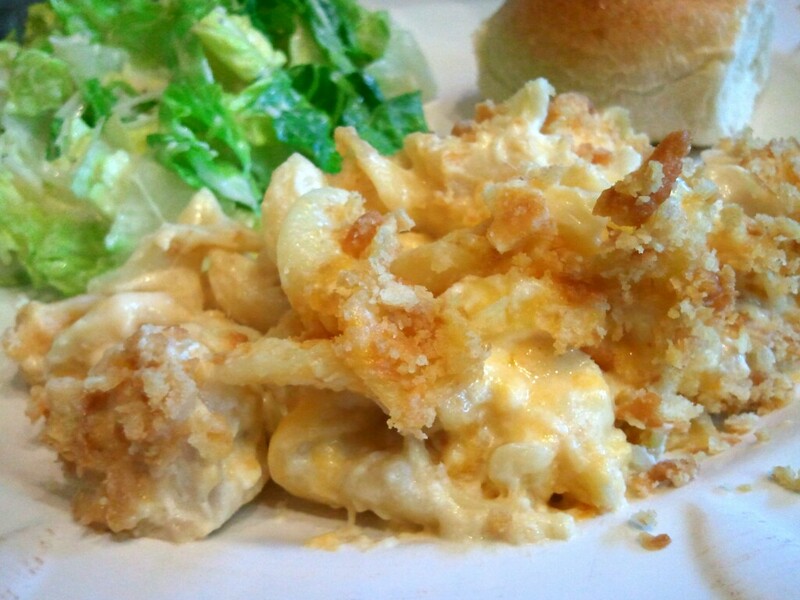 But if I had to name this dish, I would rename it Mac ‘N’ Cheese Chicken Casserole. That’s exactly what it tasted like, Mac ‘N’ Cheese. And to be honest, we get enough of that around here anyway. So, my overall opinion was an easy, quick, simple meal. Nothing fancy or amazing and very kid friendly! 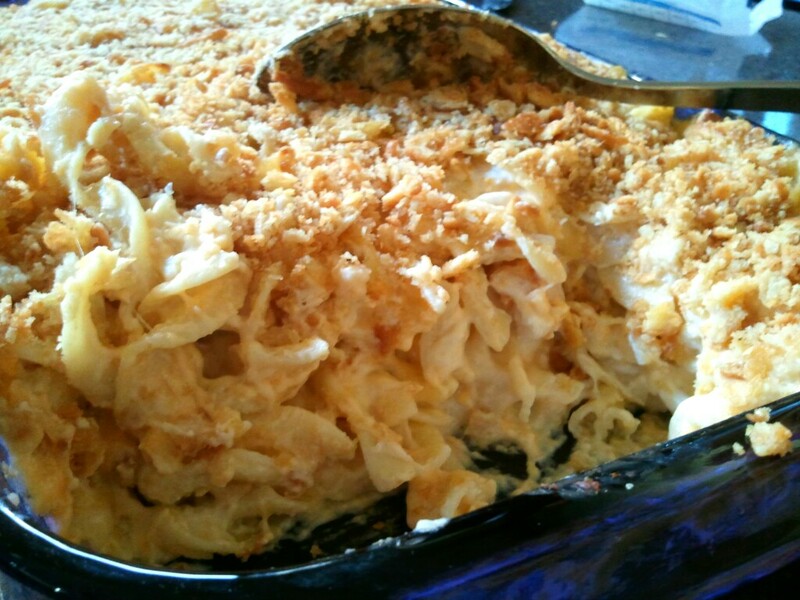 Combine chicken, noodles, sour cream, salt, soup and cheeses in a large bowl. Pour into a lightly greased 13″x9″ baking dish. Mix together cracker crumbs and margarine. Then sprinkle over top of casserole. Bake for 25 to 30 minutes or until crackers are crispy and golden and cheese is melted. This is our Dad. He happens to be holding Lucy in this picture. 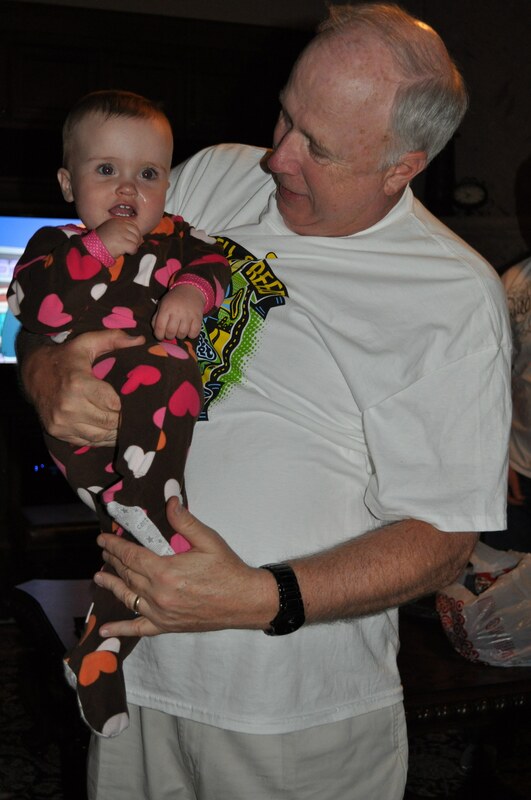 He has 11 grandkids and another on the way, and today is his birthday! I won’t tell you how old he is, because even he can’t remember! (love you, dad!) One of his most favorite main dishes is meatloaf. He has become quite the meatloaf connoisseur. So he was the perfect person to test this recipe out on. This is a classic, no frills, good, All-American meatloaf. I served to him as an early birthday gift last night. His response was simple, “It is better than average.” I’ll take it! Why? Because I really am not a fan of meatloaf. It does nothing for me. It is kind of gross to make and so honestly it’s not a dish I make a lot. However, I paired it with some salad, crusty bread, and yummy mashed potatoes. The perfect birthday dinner for my Dad. I used red potatoes and kept some of the skins on. I always add about a half stick of butter, salt and 1/2 cup of sour cream to my potatoes. 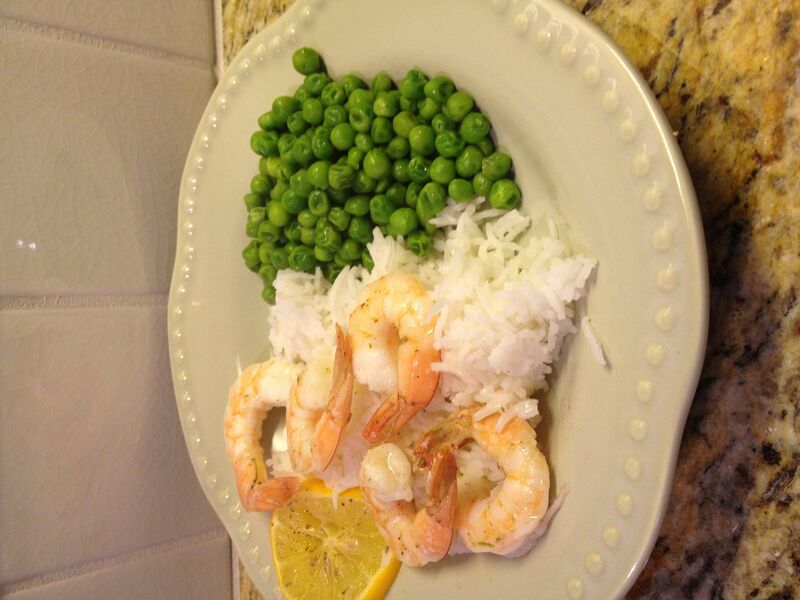 It is one of my favorite side dishes and so easy! So Happy Birthday, Dad! 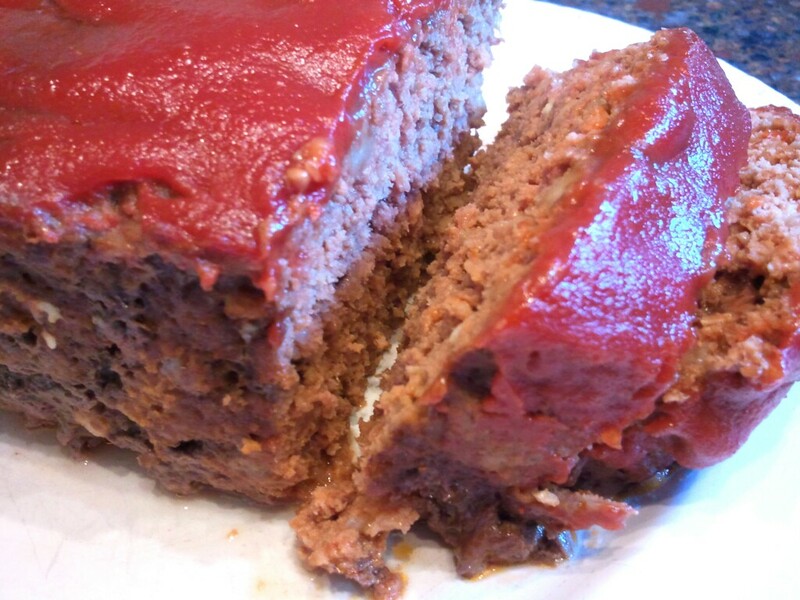 Thanks for eating my Classic Meatloaf and giving it a good review! Melt the butter in a skillet over medium heat, and cook the onion and garlic 5 minutes, until onion is tender. Remove from heat, and season with salt and pepper. In a large bowl, mix the onion and garlic, beef, crumbled bread, crushed crackers, egg, sour cream, Worcestershire sauce, and 1/2 can tomato sauce. Transfer the mixture to a 5×9 inch loaf pan. Bake uncovered in the preheated oven 40 minutes. Increase oven temperature to 400 degrees and continue baking 15 minutes, to an internal temperature of 160 degrees. In a small bowl, mix the remaining tomato sauce and ketchup. Pour over the top of the meatloaf, and continue baking 10 minutes. 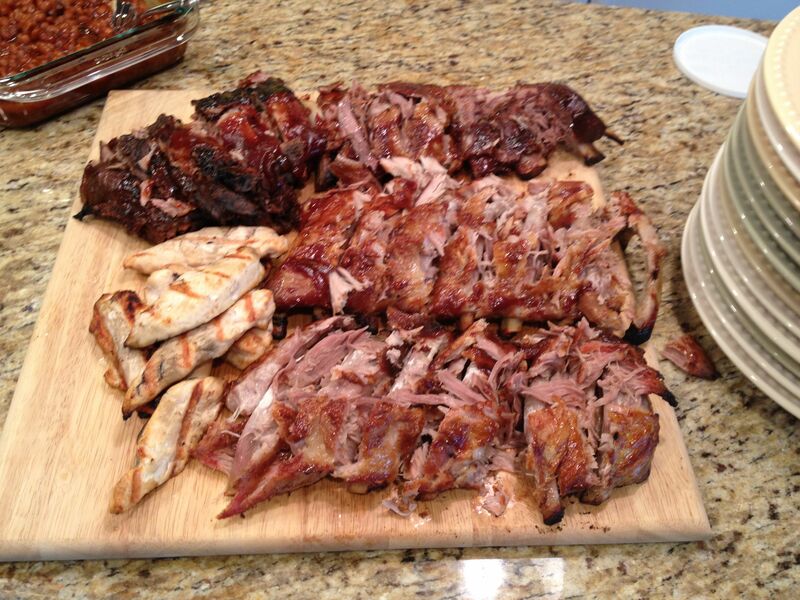 Remove from oven and let meat rest 10 minutes before serving. I used to make corned beef and cabbage every St. Patrick’s Day, but as it turns out, no one in my family is a big fan of that. So, I found myself inviting friends over to help us eat the traditional Irish meal (Pereira’s, who know who you are), while the rest of my family surfed around the kitchen for something else to eat. 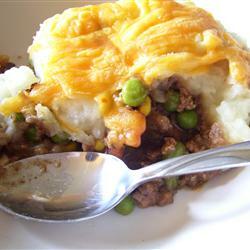 So, about 5 years ago I switched to another Irish favorite, Shepherd’sPie, and my family loves this! One of their favorite meals, but I save it just for St. Patty’s Day/ They have to have something to look forward to, right? Boil potatoes in salted water until tender when poked with a fork. Drain potatoes and pour them into a bowl. Combine creme fraiche, butter, and cream. 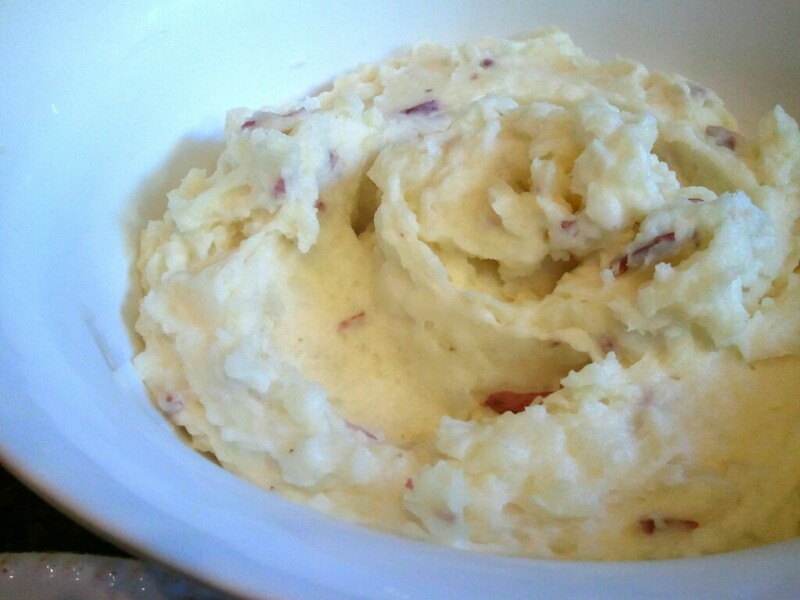 Add the cream mixture into potatoes and mash until potatoes are almost smooth. While potatoes boil, preheat a large skillet over medium high heat. Add oil to hot pan with beef. Season meat with salt and pepper. Brown and crumble meat for 3 or 4 minutes. . Add chopped carrot and onion to the meat. Cook veggies with meat 5 minutes, stirring frequently. In a second small skillet over medium heat cook butter and flour together 2 minutes. Whisk in broth and Worcestershire sauce. Thicken gravy 1 minute. 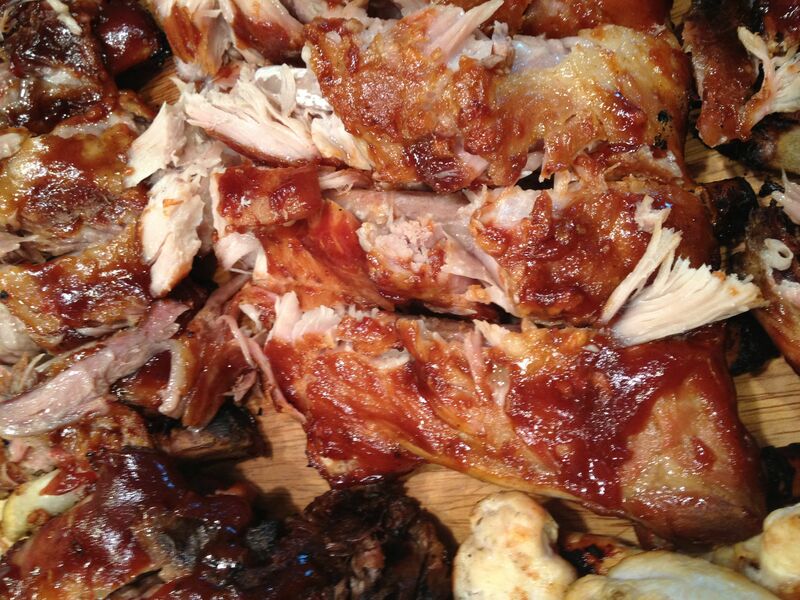 Add gravy to meat and vegetables. Stir in peas and corn. Preheat broiler to high. Fill a small rectangular casserole with meat and vegetable mixture. Spoon potatoes over meat evenly. Top potatoes with cheddar cheese and broil 6 to 8 inches from the heat until cheese is melted and potatoes are evenly browned. Top casserole dish with chopped parsley and serve.